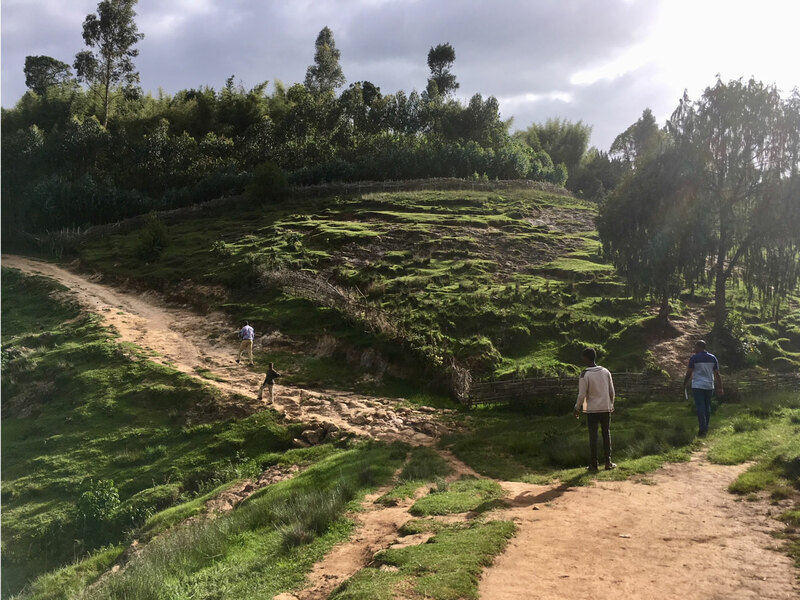 Kokosa, Ethiopia is a pastoral area, surrounded by rolling green hills, grazing cows, and tended by the rough hands of those who work the land. Getting to villages like Shote and Gisho in Kokosa is a challenge. It’s one of the reasons these communities were selected — they are rural and remote places with a significant need, and they’ve received little to no help from other organizations or the government. Explore Rural Ethiopia on our Interactive Map. When members of the community heard that Lifewater was having trouble accessing the village with the truck of construction supplies, they decided they’d build a road— with their own bare hands. Part of the new road that the community carved out of the hillside. When the truck came, they carried large rocks, concrete, and sand to the places — like the steep uphill spring — where no road could be built. The materials amounted to 8 tons of sand, 32 tons of stone and 108 bags of cement. As part of our vision for long-term, sustainable community development, communities are required to contribute 10-15% of the cost of service, whether that’s through materials, financial contributions, or labor. Shote and Gisho used to get their water from a spring that was far away, exposed to all sorts of bacteria and contamination, and produced little water in the dry season. All 450 community members used to line up for this one spring. And when they had the opportunity to have abundant clean water, they towed cement, sand, and stone every day until the Ethiopian sun burned red and yellow over the hills. Despite their labor, Buja said that joy was ever-present on their faces, and many talked about the days when their kids could be healthy and go to school. 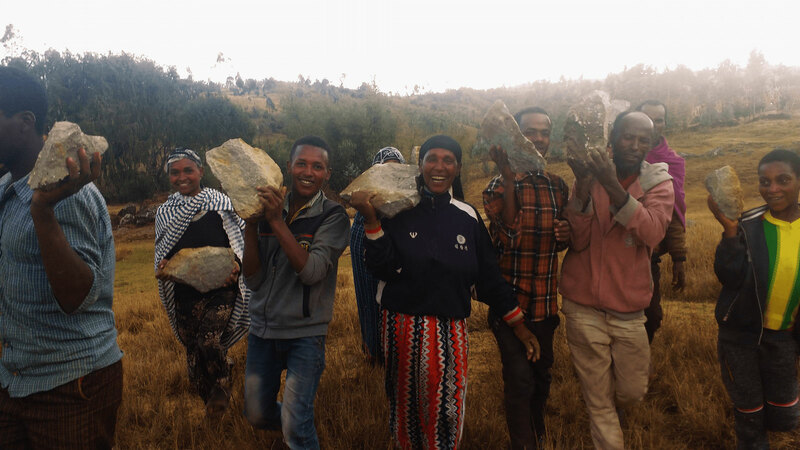 Community members carry large stones to construction locations. When the road and piping were completed, Lifewater’s engineers customized a system to cap the spring that used to be their only water source, built a water storage tank with all the supplies that the community carried there, and ensured that the piping led to the tap stands in their villages. Community members test out the water point they worked so hard for. “When we work on a pipe system instead of asking people to walk, the water is used more efficiently, cost-effectively, and it serves more people, more effectively,” Young said. A community’s commitment to their own progress is what makes that progress last. With the right resources, this determination gets children to school and hands to work. “God came to us and changed our victim and suffering through sending Lifewater to our community. It tremendously changed our lives from darkness and hopelessness to a hopeful and bright one,” Buja Bedha said. 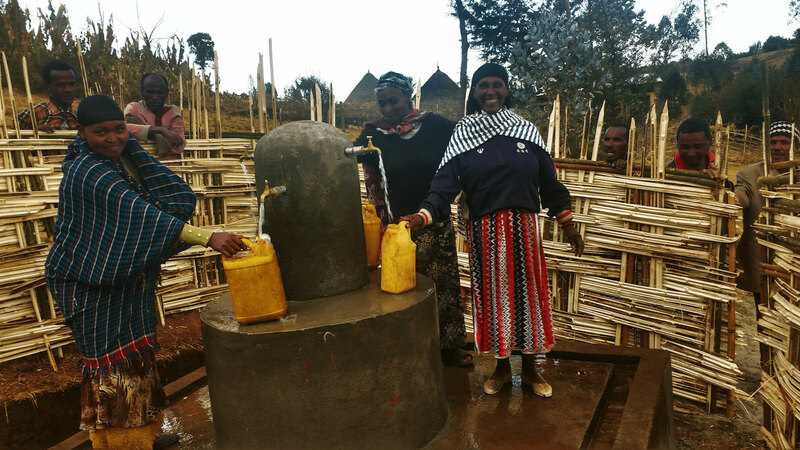 Shote and Gisho remain steadfast in their commitment to safe water. Committee members collect monthly maintenance fees to be used when repairs are needed — like a broken or cracked tap. Collections are 10 Ethiopian Birr per household, roughly 35 cents a month, an amount that’s much less costly than what they paid before for clean water, or what they were paying at health clinics for treatment of waterborne illnesses. With clean water and improved health, people can rise. Shote and Gisho decided that nothing would stop them from rising.